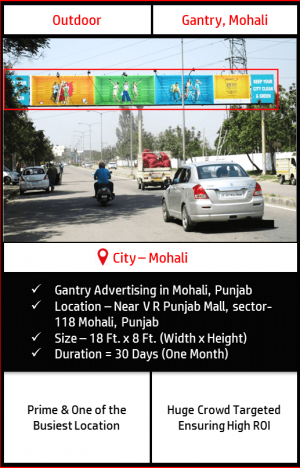 Gantry Outdoor Advertising Near V R Punjab Mall, Sector-118 Mohali, Punjab – One of the most busiest location. Gantry sized 62 Ft. x 8 Ft. (W x H) at a prime location with 30 days campaign duration. No time limit. Brand message is conveyed properly through this medium since interested target audience can take as much time as they want to understand the communication effectively. Dimensions (Width x Height) 62 Ft. (W) x 8 Ft. (H) = 496 Sq. Ft.